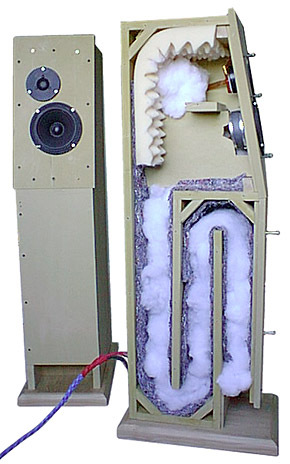 I am considering building a Daline enclosure for my Kef B110 speaker. Apparently it is critical to use couple ounces of terylene wool in the tunnels. What is this Terylene wool? Is it a fabric of sorts ? Someone described it as the material used in tropical fish filter. Does it resemble acoutasuff? The white synthetic cotton looking fluffy fibre? Last edited by apaulr; 4th April 2014 at 03:06 PM. I would have damping material just in the first half of the pipe. Damping material in the second half will reduce the fundamental and thus the radiation resistance leading to larger cone motion in that range. If you do not play that loud it might not matter that much. If you filled the whole line with UltraTouch (which I love), I don't think you'd be getting much coming out the end. fact it never did in reality, the Author had a nice line of BS. still based on the very wrong design of the original. Terylene wool is the same stuff as Polyester pillows. tapered up/down TL is likely your best bet. Stuff the 1st 1/3 of the front of the line, minimal surface damping for the rest. Last edited by sreten; 4th April 2014 at 08:43 PM. Thank you everyone for your response. I now have a better idea as to what this terylene wool is. Truth be told , over 4 decades ago when I was in my teens , my uncle and I made this kit. Daline B110. Looking back , we lined the walls of the tunnel with fibre glass as it was what we had at the time. Despite the speakers shortcoming , I do enjoy them and want to put the drivers (B110 , T15 , Coles 4001g ) in a new enclosure and an updated crossover . Dumptruck , the instruction calls for couple ounces of the wool streched out into the tunnel. I get the feeling the stuffing is not very dense. Perhaps I can play with the amount when the time comes and see what works best for me. Last edited by apaulr; 4th April 2014 at 11:27 PM.